Memphis makes me cry. I try my damndest not to let it, but it always gets me. Grabs me by the nostalgic heartstrings and doesn't let go until I cave. I always drive the same route - I start at the river and work my way east. The river reminds me of its endless history and struggle. The rest reminds me of my childhood before it all went so horribly wrong. See, my mother was happy until 1968. I mean, how could you not be happy? Get a load of those curtains! But 1968 was the year our little family moved to Atlanta for my father's new job. She was homecoming queen of her high school and a sorority queen in college. She was president of this club and that and knew just everybody there was to be known. She was, more often than not, the belle of the ball. In Atlanta, there would be no ball. Just us kids growing older. But before I turned five years old in 1968, I was the happiest daughter in the history of daughters, because I had the happiest mother in the history of the whole Universe. The summer before we moved, I was four and my brother was eight. He was out of school, and every day was like a birthday party. My mother and I would wet sponge-stick S&H green stamps into these books that plumped and ruffled as they dried, and we’d shop in the catalogs for all the things we would buy. 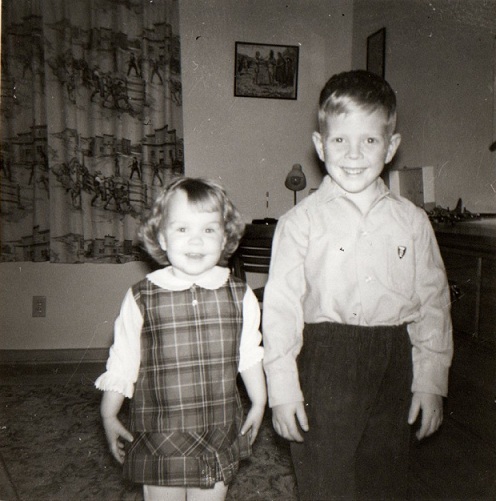 Sometimes, we would sit on the porch and paint our toenails and brush and fix each other's hair with a million different multi-colored thick yarn bows and shiny ribbons and plastic ball ponytail holders, while my brother played with his friends in the yard. On particularly good days, we would dress up and pretend to be in beauty pageants. As I grew up, I came to hate all these things (which put another crack in her already broken heart), but back then, all I knew was that my mother was smiling. Every so often, we would go places. We would have lunch with people, we would take her mother, who didn't drive, to appointments, or, on really special days, we would go shopping at Sears. The Sears on Poplar Avenue was something to behold (the picture doesn't do it justice). It was gigantic (I swear!) and white and all brick and had a huge, long walkway leading up to it like it was a castle. The walkway was covered to protect shoppers coming and going from the parking lot. It was lined with little Bradford Pear trees and ran the whole length of the parking lot, which, back then, felt like miles. On our way in to the store and before getting in our car to go home, my mother would sit on a bench and watch us run up and down that walkway over and over and over and over. She'd apologize to the poor passersby trying to use the path for its intended purpose. But she would smile and smile. And laugh. When my mother laughed, everything else in the world disappeared. She was always ashamed and would cover her mouth, but she was never more beautiful than when she laughed. As if the walkway weren’t enough, right inside the store’s front door was a candy counter. Someone would inevitably open the door for my mother, and we'd follow her inside hoping for the best. The smells of nuts and candies and chocolates and gums were so strong that you could taste the air. The whole area was decorated in red and white checks and there were a million glass displays of all kinds of goodies. My mother would always pretend that we were in a hurry and didn’t have time to stop. And we’d beg and plead and pull on her arms and her purse and her dress and anything we could grab a hold of until she let us pick out one thing each. She loved watching us try to choose. We'd press our noses to the display cases and run our dirty little kid hands up and down each and every one. We'd pick one thing and change our minds and start all over again. And she'd laugh some more. Then, the man with the paper triangle candy-man hat would scoop and weigh and pour our gold into little paper bags and hand them to us to take home. Outside, we’d thank her profusely, and she would hold our little bags while we took one last spin around the walkway. But 1968 clipped her wings and she was never the same. I grew older and she grew more lost and lonely every year. She tried so hard in the next twelve years before her death, but she was never happy like that again. And neither was I.
I took pictures this time, but I'm not sure I should have. My memories are better, bigger, newer, and sunnier. Although, this house on the corner of Central and Greer has always been my favorite. And it's where I turn to go to my grandmother's house (which was red brick when they lived there), where we spent every summer until I was twelve and she came to live with us in Atlanta (her husband died in 1970, just two years after our fatal move). I didn't understand their overwhelming sadness about that day at the time, but now I think I do. Neither of them had a home anymore. I'm not familiar with this sense of belonging, but apparently, it's something I long for and that I feel nowhere else. So, Memphis, I'll see you in a couple of years, and I'll take my little drive, have my little cry, and think about the time I felt part of something really good.